Going to a concert whilst wearing a suit is an interesting experience, especially after previously being at a do at the Polish Embassy (yes, really). Ignoring the puzzled glances from my fellow gig-goers at the Shepherds Bush Empire, I settled into the capacity crowd, sadly not at the front. What, you think I’m going to get creases in these trousers? 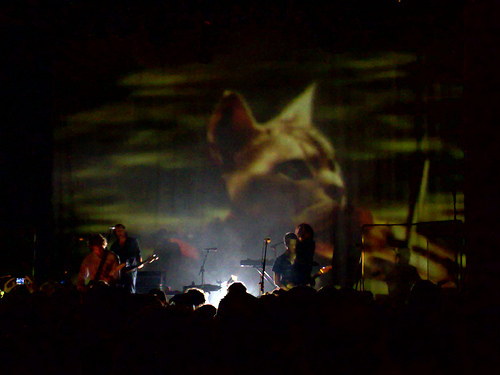 Mew, in case you didn’t already know, are one of the most adventurous rock bands around these days. Their songs blend heartstoppingly brilliant bits with slightly more tedious bits. Their best songs blend heartstoppingly brilliant bits with even more brilliant bits. If you get bored at any point, you are safe in the knowledge that in a minute or so they will change the tempo and the key, and probably everything else they can think of. Sometimes their songs go from strange to utterly fantastic gradually, so you are suddenly aware that a tune that had only moments earlier made no sense whatsoever had become akin to the music played at the gates of heaven. Having seen them live before, I kind of knew what to expect, so my main concern was whether their new material would stand up to the live treatment. And my other main concern was, do they still have the freaky videos? To which the answers were yes, and oh sweet Mary mother of Jesus, stop it with the mouths. Kicking off with “Intro/Reprise”, they soon kick into gear with “Hawaii”. What shocks you immediately is their ability to translate their hugely complex songs into a live performance. Jonas’s voice is a truly wondrous thing; crystal clear and pitch perfect. And they are loud. Properly, knee-shakingly, chest-tremblingly loud, almost up there with The Twilight Sad. Which is good, as I don’t have to listen to the people behind me wittering on. 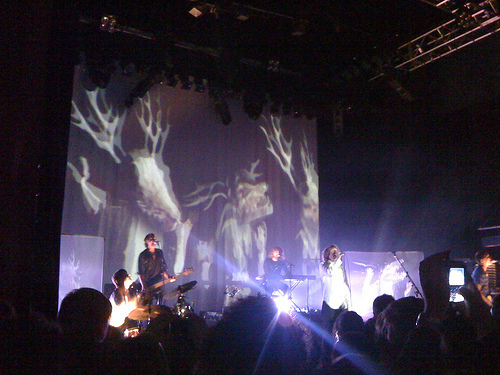 About halfway through, the screens behind the band suddenly flash to life, showing men dancing around with deer’s skulls. It’s really quite odd. And up go the hairs on my arms for the first of about fifty times. 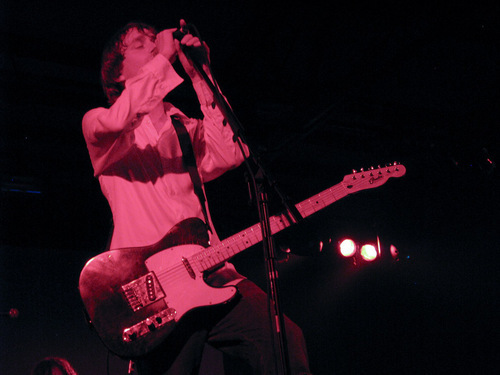 Next up comes a sequence of songs that a less talented band would have broken up and scattered throughout the show, but Mew have such utter confidence in the strength of their material that they can joyfully play four of their best songs in a row without worrying about keeping folks interested. Those songs are, of course, the New Order-esque “Special”, “The Zookeeper’s Boy”, “Am I Wry? No” and “156”. “Special” kicks off with a down and dirty guitar riff, far rougher than on record, and during the song everyone starts clapping. You can’t beat a bit of audience participation. “The Zookeeper’s Boy” is played with a backdrop of dolls, with toy animal heads with human mouths, singing along. It’s really quite, quite disturbing. And odd. The song ends with four of the band singing counterpoint1, and it’s really quite, quite astonishing. I was at this point standing there with my mouth hanging open. I can only hope there wasn’t any dribble coming out. Then the opening riff to “Am I Wry? No” starts, and the place goes, as they say, mental. Now, this being the first song of theirs I ever heard, it’s got that special place in my heart, and I love it when a band can translate everything you love about the song on record into an even better live version. I had to stop myself singing along (not that this would have mattered, frankly). And “156” is stripped down – yes, Mew can strip songs down, believe it or not – until about half way through when the guitars come in and tear through the ominous quiet of the first half. 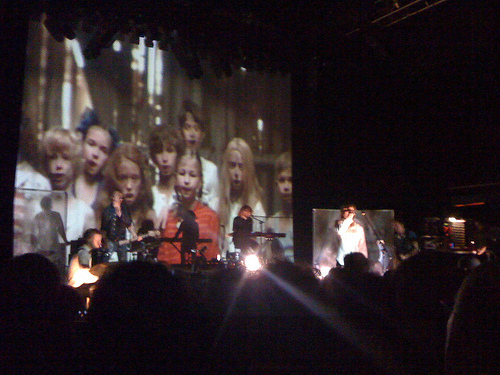 After that, songs came thick and fast, and unfortunately I don’t have an accurate set list (despite those marvellous people at the Mew Forum). “Introducing Palace Players” has such a bizarre, discordant riff that it makes me wonder how the guitarist introduced it to the rest of the band at a practice. “Hey, Jonas, it’ll sound much better when you start yodelling over the top, honest”. I would dearly love to walk past a guitar shop and hear some spotty teenage axe hound trying to play it. Maybe that’s why this lot aren’t selling out the O2 like Muse – whilst the latter also make hugely complex, ornate music, you can still just about knock out one of their riffs. This lot? No hope. Still, I’d much rather be here than at the O2. There was even an exceedingly odd moment with a talking bear thing. I really have no idea what the hell was going on – see if you can make sense of it yourself. So, on went the wonderful songs, and the bonkers videos. Wolves, lampreys, more dolls with animal heads, and the guitarist dancing around with a mask on was a real eye-opener. “Silas The Magic Car” was a gratefully recieved quieter moment, and I was struck by just how great this lot sound singing together. Take that, Fleet Foxes! “Repeaterbeater” swooshed by like a train filled with mutant guitarists. The icy ferocity of “Snow Brigade” shook us to the core, and then the band left the stage. But we all know what was to come next; well, at least those of us who’d seen them before. A Cat! Playing A Violin! On came Bo Madsen to play the “Comforting Sounds”, and Jonas sauntered on just in time to start singing. Then, as his singing reached the climax, the rest of the band came on, and anyone in the venue who had even the slightest doubt about Mew being absolute masters at this lark had those doubts thrown into the skip outside. The starfield behind the band suddenly changed to more animals, but this time they were actually cute little things, all playing violins. Look, a teddy with little round glasses! A bunny with a twitchy nose! A strange corpse skull thing! I was struck by the thought that this is possibly the best gig-ending song I’ve ever experienced. All I have to say about Mew is this. They should go on tour with someone properly, massively huge, like U2, or Coldplay, or the aforementioned Muse, as they would blow the headline act totally and utterly out of the water. Whilst I wish huge success on all the bands I love, I really wouldn’t want to see Twilight Sad or Tindersticks or whoever play Wembley Arena or the O2. But Mew could just fill a place like that with a song like “Comforting Sounds”. And whilst their music is complicated and sometimes bizarre, so are Muse, and I know who I’d much rather go and see. Please go and see them for yourself and find out what I’m on about and why I have written this huge article. You won’t regret a second. Except the bits with the mouths. Stop it with the mouths, will you? 1 At least I think that’s what it’s called. They all sing different bits, not like a round. Oh, you know what I mean. Note: All photos courtesy of kind people posting them on Flickr.